Hydraulic airless sprayer piston pump is designed for heavy coat, industrial painting, commercial coating,like putty plaster epoxy bitumen gypsum mud elastermeric etc. all kinds of heavy duty painting projects. 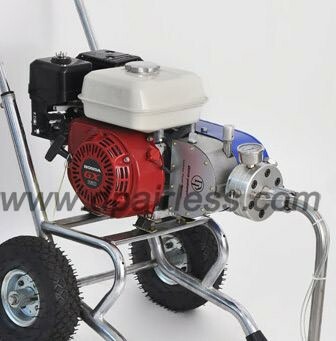 Gas powered airless paint sprayer equipment, equipped with piston or diaphragm airless pump, The gas powered airless sprayer is ideal for outdoor building exterior painting jobs without electricity. Dustless drywall sanders, and cement polisher, concrete grinder tools, for dust-free dry wall sanding polishing jobs, The drywall sander tool is ideal for professional contractors, builders, DIYer's. Air mix airless paint sprayer (combined with air compressor) are designed for precise surface fine finish coating, like furniture,wood, or automotive. It combine the air compressor with airless sprayer pump equipment together, the atomization will be better finishing. Electric Automatic Paint Roller/Paint Brush Pad, Battery Powered Paint Roller, Paint Roller combined with Airless Paint Sprayers, etc. for DIY hobby user or contractor using. Mainly for internal wall latex job. Putty plaster gypsum cement-mortar sprayer machines, for professional contractor builder, spraying the putty drywall-mud, plastering, cement mortar, rendering interior and exterial jobs. Spare parts for airless sprayer like piston rod, v-packing, diaphragm, valve, membrane, fluid pump,pressure sensor, repair kit for DP-airless etc different brand painting equipments. Drywall texture sprayer could spray all kinds of heavy texture, cement plaster, spray onto the drywall like popcorn, The texture sprayer use hopper or screw pump etc. An airless sprayer is a pump that transfers paint under high pressure (usually around 3000 psi) via a high pressure paint hose (usually about 15m long) to a airless spray gun. When the trigger is pulled on the airless spray gun, fluid is released through a small orifice spray tip or nozzle which breaks up fluid into small droplets (atomization) without the use of compressed air. The tip also creates the fan pattern of the atomized spray depending on the size of the tip selected. The airless paint spraying is 10 times faster than hand brushing, 7 times than paint roller, 2 times to conventional air paint sprayer. but airless has much less overspray, less bounce back of the paint on the spraying surface. so the airless spray equipment is ideal for large area painting job like a house, roofing, wall, floor, steel structure, waterproofing or fireproofing etc. Who is DP airless paint sprayer? China Dino-power is professional manufacturer and supplier for high pressure airless paint sprayers , electric / gas / hydraulic / pneumatic airless sprayers , air-operated double diaphragm pump etc. which are suitable for all kinds of big area painting jobs such as wall, roofing, floor, house, building and construction, metal structure fabrication, shipyard & decks, factory, residential, commercial, interiors and exteriors decoration, fire proof, putty spray, anticorrosive project etc. Spraying with all kinds of materials like primers, basecoats topcoats, lacquer, latex, paints, emulsions, enamels, high solid epoxy, polyurethane, emulsion coating, etc bothoil-based & water-based coatings in low, medium to high viscosity. Currently we're selling to countries all over the world, over 60% are for American & European countries. all our sprayers have 1 year warranty, and the pro series got 2 years warranty. all our paint sprayers are 100% tested before ship out. we'll always ensure the best quality & best performance for our equipments. Contact us now if your want to be our representative or distributor in your country. we'll support you with competitive price, professional service, and fast delivery. One of the first decisions that you need to make when choosing an airless paint sprayer has to do with the size job that you are going to be doing. If you’re just going to be doing smaller jobs around the house, you can generally pick up a small paint sprayer like our X6, this model can certainly handle small to medium-size painting jobs around the home. 1. What materials will you be spraying? The type of material being sprayed will determine the spray tip size needed. you can take reference from the tip size selection guide and check the right spray tip for right material. 2. How many gallons per week will you spray? or how many square meters you would spray? Different size paint spraying job need different capacity sprayer equipments. 3. What types of surfaces will you be spraying? Different surfaces require different material and finish quality. You have to consider the material and desired finish in order to choose the right sprayer and spray tip. When is it TIME to replace your roller sleeve?